So I’m a little behind schedule with my CHD website. I’m supposed to implement my bus schedule and Smokehouse article, but with all the recent church activities and Chinese New Year shopping and office work, I find little time to have a clear thought as to what articles to include. Sure, I’ve collected lots of materials and I just have the idea at tip of my tongue but could not find the clear train of thought to write a clear sensible article for posting onto the website. Sigh! Well let’s hope God will give me a new beginning with wisdom and creativity and off course God’s favour for the success of the website. 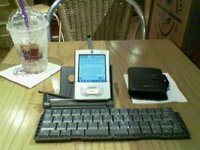 Even now as I sit in the Coffee Bean shop in MidValley Megamall typing away at my mini Palm wireless keyboard, testing out the idea of “while waiting for my missus to shop, I can at least cook up some articles for website or blog”. Gee weez, this keyboard is really nice to use. So is this Quickword software, which is much better than Dataviz DocsToGo though it has some flaw when converting it to word. But there are still some work arounds which I could try. A bit tedious though transferring the file from one software to another before getting up into to desktop PC for final posting into the website. Look like this was the last wireless keyboard going for RM220. I checked around the IT shops but could only find RM350+ keyboards for Palms though their designs were different. Still this is good enough! Yes! Good idea this wireless keyboard. Now I can hopefully crank out articles without wasting time sitting around in the mall. All I need to do is find a comfortable place like Coffee Bean or Starbucks and start tapping away. I think this blog is heading nowhere, so if anybody is reading this, so sorry for my soliloquy. I’m just trying to fill up my time trying to do something productive. But without any materials for reference, kind of hard to figure out what are the things to write right now. Ah, my brother just went through my website and said my grammar is rather odd. Seems like I write neither like English nor a Brit, but like a Dutch. Well, maybe my name may sound Dutch, but hey, writing is about getting a personal voice that is inimitably linked to the author. I’m still trying to develop my own writing voice but I guess this will need working. Ah, my wife calls. I guess it is finally closing time around here. 11 o’clock at night is rather late, but at least I get to try out how useful bringing along my Palm Tungsten and wireless keyboard.